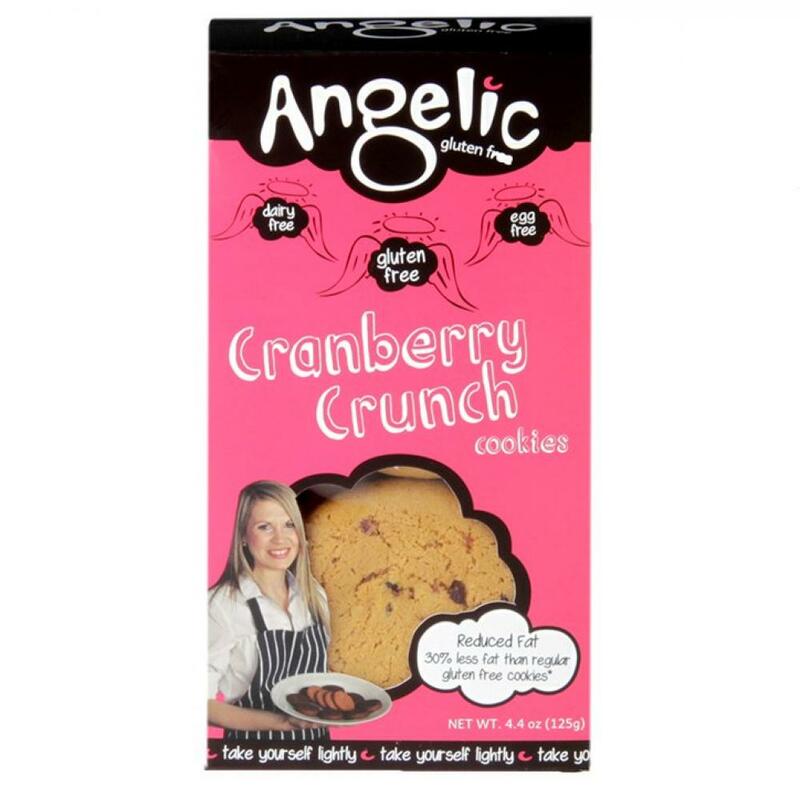 Angelic Gluten Free Cranberry Crunch Cookies are made using sustainable palm oil and contain at least 30% less fat than other gluten free cookies. They are baked with sweet tasting cranberries and are a perfect light treat to have with a cup of tea or on the go! Ingredients: Gluten Free Flour (Rice, Potato, Tapioca, Maize, Buckwheat), Sugar, Margarine (Vegetable fats: Palm, Vegetable oil; Rapeseed, Water, Salt, Flavourings), Golden Syrup, Chocolate pieces (6%) (Cocoa Mass, Sugar, Cocoa Butter, Emulsifier: Sunflower Lecithin), Emulsifier (Sunflower Lecithin), Raising Agents (mono calcium phosphate, sodium bicarbonate), Tapioca Starch, Stabiliser (Xanthan Gum), Natural Flavouring, Salt. Made using a nut free recipe, however cannot guarantee no trace of nuts. May contain traces of milk.